And so the much-awaited Indian tour started. Captain Virat Kohli lost the toss, wanted to bowl, but instead was asked to bat first. The pitch looked bare, had a tinge of grass, Kohli hoped it would be a good wicket, out walked the openers, played out the first over for only a run, a typical Indian start. 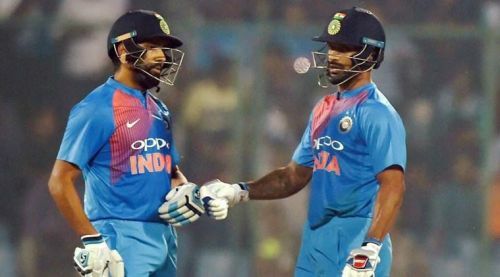 So Shikhar Dhawan wanted to do something about it, took charge of proceedings, coerced Rohit Sharma out his extended bubble and India then tried to emulate the world in how T20 should be played. Both batsmen thrashed 10 in the second over and then 17 in the third over and so they zipped past the third over, the run rate shot up and the platform was perfectly set up. Dhawan took the lead, Rohit followed, caught up with him and then both were cruising along. Barring a couple of overs from George Dockrell, the left arm spin bowler, they spared no other bowler and almost every over yielded almost 10 runs and Ireland began to feel the pinch under the glaring sun. Rohit Sharma took on the young offie, Simi Singh, Dhawan did the same against Dockrell after his first couple of tight overs. They were bashed out of sight, Gary Wilson tried to juggle around with options, the batsmen kept slapping them away. The sun was getting hotter for the hosts who could be forgiven for being overawed, such was the support for the Indians. 94 for no loss after 10 overs, both batsmen stamping their authority, and stamping on any tactic Wilson was throwing towards them. As it so very often happens, the pinch was getting far too much for the hosts, who slipped and tripped, dropped as many as three catches in the field, and did not do any favours for themselves. George Dockrell finished his quota of four overs for 40 runs. Kevin O'Brien tried to shuffle his lengths and change his pace, but it was being carted away. However, in the final ball of his 16th over, he bowls a full ball, Dhawan tried to hammer it away over long off, did not connect, skews it and Stuart Thompson ran in from long on, slid and got the catch. He breathed a sigh of relief, Ireland breathed a sigh of relief, Dhawan sauntered away. The opening stand was worth 160, Dhawan carted 74 off 45 balls, Rohit was there on 80 off 51 balls.